Despite Facebook’s US traffic has fallen down over the past few months the social networking site seems to be rapidly reaching its major rival MySpace. The most recent data revealed by comScore shows that Facebook had 33.9M unique visitors for January 2008, which represents 2% down from its traffic for December 2007. Earlier this week, the U.K. unit of audience measurement firm Nielsen reported that traffic from several social-networking sites, including Facebook, had slightly declined in January 2008 from December 2007. Facebook’s international traffic, however, seems to keep on growing. It is reported to have grown with 3% in January 2008 over December 2007 reaching the astonishing number of 100,7M unique visitors worldwide. MySpace, by contrast, has been reported to have had 109,3M for the same period – increase with 2% month over month. MySpace has also shown a slight decline in its American traffic for the same period, so it has something to do with the entire social networking sector on Web and not really with Facebook in particular. However, the little drop of traffic in perhaps the hottest start-up company in Silicon Valley after Google reveals something interesting. It could mean the free lunch (buzz) for Facebook is over and no more the company’s rapid growth will be taken for granted and something that would last forever. It’s now the time for a real test for Facebook’s concept, business model and sustainability. In our view there is really nothing wrong with a company that from 100.8M, say, uniques per month drops down to “only” 100M a month later – it is all about the overhype and huge buzz that company got over the past year, which has risen the expectation level to the skies and now it is pay back time. Otherwise it seems there is nobody noticing that slowly but surely the Facebook’s traffic is reaching the traffic numbers of its main rival MySpace – 100,7M and 109,3M for MySapce respectively. Yet the MySpace’s pure American traffic (68.6M) seems to be double more than Facebook’s (33.9M). Facebook is based in Palo Alto, Calif, and it has taken more than $330M to date in funding. Microsoft, a Honk Kong billionaire and The Samwer Brothers are among the company’s most recent investors. MySpace, by contrast, has been bought on July 1, 2005 by Fox Interactive Media for $580M and is currently based in Beverly Hills, Calif. Founders Fund, a non-traditional investment group, has raised an institutional fund in the amount of $220 million. The new fund, Founders Fund II, will allow this team of four managing partners, who themselves are founders and entrepreneurs, to leverage their individual expertise and deliver their unique business model, which puts the entrepreneurs first. Founders Fund has developed a comprehensive package designed to create near perfect alignment of interests between founders and their investors. Founders Fund II will be invested in approximately 15-20 innovative early-stage start-up companies. This is the first institutional money raised for the Founders Fund, representing a significant increase over the original fund of $50 million, which was raised from personal investments by the managing partners and select outside investors. 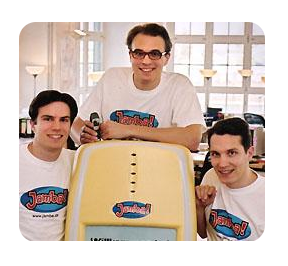 San Francisco based Founders Fund launched in 2005 with a $50 million venture fund. They’ve had two liquidity events since then, and a number of other very high profile participations like Facebook, Powerset, Ooma, Quantcast, Slide, Geni and Causes. The Founders Fund will continue to offer Series FF stock, which is being adopted across the industry adding to the unique approach to funding entrepreneurs. The stock is offered to start-up founders who can convert Series FF stock to preferred stock during subsequent rounds of funding. This allows Series FF stock holders to sell a portion of their stock and aligns their interests with their investors. A couple of investments have been made out of the new fund, they say, but have not yet been disclosed. The four managing partners have all started their own companies and between them have seen the process from inception to start up to IPO. Parker says he learned a powerful lesson about the importance of taking time to build a business from observing the trajectories of some of the valley’s most successful businesses. What would have happened if the founders had sold those companies before fine-tuning them? PayPal started out as an encryption product that beamed money between mobile devices before hitting on the online payment business that it ultimately sold to eBay for $1.5 billion. Google didn’t strike Internet ore until the paid search market had time to fully develop. However, some institutional investors were skeptical of the partners and passed on the opportunity to put in money. Parker confirmed that the fund-raising process turned out to be more time consuming than the firm had expected. But he also said limited partners had invested because their model — namely, a venture firm run by founders with experience — was needed in the industry. The firm originally sought to raise $150 million, but ended up raising $220 million. Based in San Francisco, Calif. and founded in 2005, Founders Fund is a group of four proven entrepreneurs with a shared vision: to change the way venture investments are made. Founders Fund seeks to provide the capital, insights and support required to build a company from the ground up and sustain successful enterprises with a non-traditional, founder-focused approach. 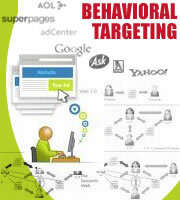 Their current portfolio includes Facebook, Geni, Powerset, Ooma, Quantcast, Slide and others. Peter’s experience with venture finance began in the 1990s, when he ran Thiel Capital Management, a Menlo Park-based hedge fund that also made private equity investments. In 1998, Peter co-founded PayPal and served as its Chairman and CEO until the company’s sale to eBay in October 2002 for $1.5 billion. Peter’s experience in finance includes managing a successful hedge fund, trading derivatives at CS Financial Products, and practicing securities law at Sullivan & Cromwell. Peter sits on the Board of Directors of the Pacific Research Institute and on the Board of Visitors of Stanford Law School. Peter received his BA in Philosophy and his JD from Stanford. Peter Thiel is a 39-year-old maverick money manager who in the past four years has turned his $60 million payout from the sale of the PayPal online payment service he co-founded into a growing financial fiefdom. He runs Clarium Capital Management LLC, one of the nation’s most successful and daring hedge funds with $3 billion in assets, and The Founders Fund, a tiny but increasingly influential venture capital firm with a laser-beam focus on consumer Internet startups. In late 2004, Peter Thiel made a $500,000 angel investment in Facebook. Microsoft recently purchased 1.6 percent of the company for $240 million, which values Facebook at roughly $15 billion and Thiel’s stake at roughly $1 billion. Ken is a co-founder of PayPal and served as the company’s first CFO. While at PayPal, Ken helped raise over $200 million in private financing, worked on the company’s public offerings, and assisted in the company’s $1.5 billion sale to eBay. Ken has also been a member of the research and trading teams at Clarium Capital Management, a global macro hedge fund based in San Francisco with over $3 billion under management, and at Thiel Capital Management, a multistrategy investment fund, where Ken made venture investments beginning in 1998. Ken received a BA in Economics from Stanford. 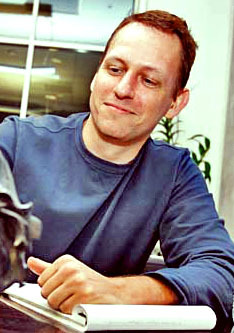 Luke Nosek is a co-founder of PayPal and served as the company’s Vice President of Marketing and Strategy. While at PayPal, Luke oversaw the company’s marketing efforts at launch, growing the user base to 1 million customers in the first six months. Luke also created “Instant Transfer,” PayPal’s most profitable product. Prior to PayPal, Luke was an evangelist at Netscape. Luke has also co-founded two other consumer Internet companies, including the web’s first advertising network, and has made a number of venture investments since 2000. Luke received a B.S. in Computer Science from the University of Illinois, Urbana-Champaign. Sean Parker is the co-founder and Chairman of “Project Agape,” a new network that aims to enable large-scale political and social activism on the Internet. Previously, Sean was the co-founder of the category defining Web ventures Napster, Plaxo, and Facebook. At Napster, Sean helped to design the Napster client software and led the company’s initial financing and strategy. Under Sean’s leadership, Napster became the fastest adopted client software application in history. Following Napster, Sean co-founded and served as President of Plaxo, where he pioneered the viral engineering techniques used to deploy Plaxo’s flagship smart address book product, ultimately acquiring more than 15 million users. In 2004, Sean left Plaxo to become the founding President of Facebook, one of the most rapidly growing sites on the Internet today. Sean sits on the boards of several private companies. Developing Facebook applications and taping into their millions of registered users appears to be yet another marketing instrument employed even sometimes by brick and mortar retailers like the UK’s TopShop. The new Topshop Fashion Fix which has recently been launched on Facebook allows users to see the newest must-have pieces for the season from their Facebook profile. 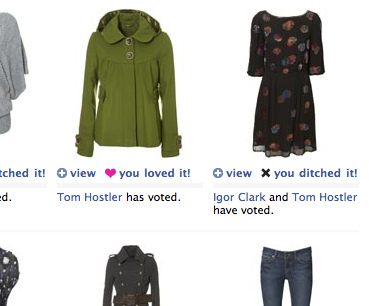 Facebook users can view items in detail and stamp a “love it or lose it” comment for their friends to see. Pieces can be shared and passed to other Facebook friends to talk about the latest styles, plan outfits or simply arrange shopping trips. The Topshop Fashion Fix application was created and produced by a digital agency called Poke, and developed in collaboration with the Topshop internal web team. Poke is a six year old creative agency for the digital age. Poke has built a reputation for engaging, challenging design communications work with a select group of high profile clients. Poke is the only UK-based agency to have been awarded the digital industry’s equivalent of the ‘Oscars’ – New York’s Webby Awards – three years in a row (2005-2007). Poke opened a US office in New York in April of this year. Poke has worked with Topshop since 2003 conceiving and delivering a number of successful online projects, including the design of their e-commerce store, the Kate Moss collection and the Topshop video podcast. The launch of the Kate Moss fashion line for TopShop accounted for a surge in traffic to parent company Arcadia Group’s website, which enjoyed a 17% boost in unique users. As an added incentive for Facebookers eager to try out the new application, during the run-up to Christmas, Fashion Fix users can play a weekly game of “Snap” on Facebook to win anything from 10%-off at Topshop.com to a year’s supply of shoes. With thousands of groups already networking about Topshop and swapping ideas about what they’re about to buy, this application ensures that they’re the first to see what’s new in-store. The Fashion Fixes’ sharing and commenting features also allows them to have lots of fun in the process – and makes sure that their friends know exactly what they’re planning to wear at the weekend. With daily updates and over 3000 different items to shop at any one time, Topshop.com is one of the UK’s biggest online retailers with an exciting and dynamic site to reflect the brand’s image as an innovative fashion authority. Topshop.com is Topshop’s second biggest store and a leader in the digital market place. Communicating to it’s customers via the weekly ‘Style Notes’ email (a magazine-like reminder of news with 350,000 subscribers), two RSS feeds (the ‘Style Blog’ and ‘Daily Fix’), their cute desktop ‘widget’ and video podcasts (including 9 London Fashion Week catwalk movies published within 24 hours of the shows), Topshop engages with their young and dynamic audience in ways that they understand. Topshop was established in 1964 within a Sheffield department store called Peter Robinson, however, a year later, the same store allocated Topshop space in the basement of its Oxford Circus store in London. In 1974, Topshop was taken out of Peter Robinson and set up as a standalone retailer. When Jane Shepherdson became Brand Director in 1999 her vision was to establish the brand as a fashion authority. Since then, Topshop has gone onto become one of fashion’s major success stories with over 309 fashion stores nationwide, including the world’s largest fashion store at Oxford Circus, which attracts over 200,000 shoppers each week! In September 2005 Topshop showed its in-house design collection Unique (created in 2001) as part of the official London Fashion Week schedule and subsequently forged exclusive partnerships with international boutiques ‘Opening Ceremony’ in New York, ‘Colette’ in Paris and Tokyo’s ’10 Corso Como Comme des Garcons’. During summer 2006 ‘Barneys’ in the US began retailing Topshop’s best selling Baxter jean in its flagship stores. Plans to expand internationally are also underway with stores in Moscow and St. Petersburg due to open in 2008. The story was initially picked up from EPR Network.